Christmas is less than a month away already, and that means this next month will be filled with parties, dinners & gatherings. These can be an excellent time for your piano kid to share some music with friends & family. 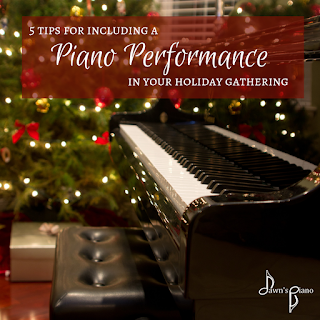 Today I've got 5 tips to make this an experience that entertains your guests while building the confidence of your piano kid. 1. Have fun! - Let this be lighthearted and celebratory. Whether you're all sitting quietly to listen to the music, or they are playing background music to your family meal or time together, let the spirit in the room be fun, lighthearted, & filled with encouragement. Today I'm sharing a newly updated version of my arrangement of "Let it Snow!" for late intermediate to early advanced pianists. 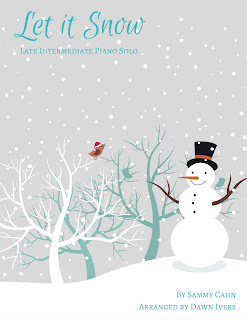 This is a fun, lighthearted piano solo that will delight guests at holiday gatherings & bring smiles to the audience at your holiday recital. The arrangement explores a couple different bass clef accompaniment styles to lend variety & movement to the repetition of the well-known chorus. Students have the chance to work on some dynamic, articulation & voicing changes throughout the piece as well. You can hear the track using the player below. The sheet music is published through SMP Press, if you are interested in publishing your own compositions or arrangements and letting someone else worry about the copyrights or hosting files, use my affiliate link to get started. Looking for more sheet music for the winter months? Here are a couple more to try. We spend a lot of time in lessons and home practice working on developing skills like sight reading, rhythm, ear training, technic and performance skills. Wouldn't it be great if there was a year-end evaluation to help us determine if these concepts are truly being retained? Well good news, there is! 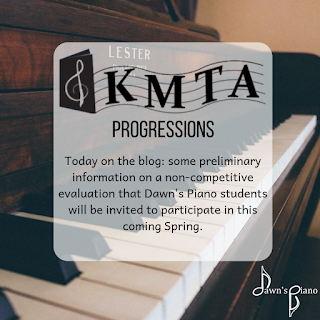 As a member of KMTA, I am proud to be able to offer participation in Kansas Music Teachers Association Progressions evaluations to my McPherson area students. "Music Progressions is designed to be a suggested curriculum of independent music study. This curriculum is coupled with an annual evaluation sponsored by KMTA local associations and/or groups of KMTA teachers. This Saturday, the studio hosted it's first ever Broadcast Recital (learn more about why we chose this recital format here), and if you missed it, that's ok, because here is where you can watch the video replay!